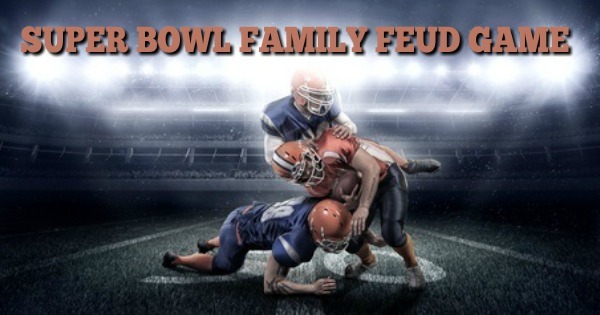 It's time to play Super Bowl Family Feud! Don't know how to play? See our full instructions here or for an EASY WAY TO PLAY with any size group CLICK HERE! 01. What body part is often discussed when it comes to football? 02. Name a word or a phrase a cheerleader might shout out during the game. 03. 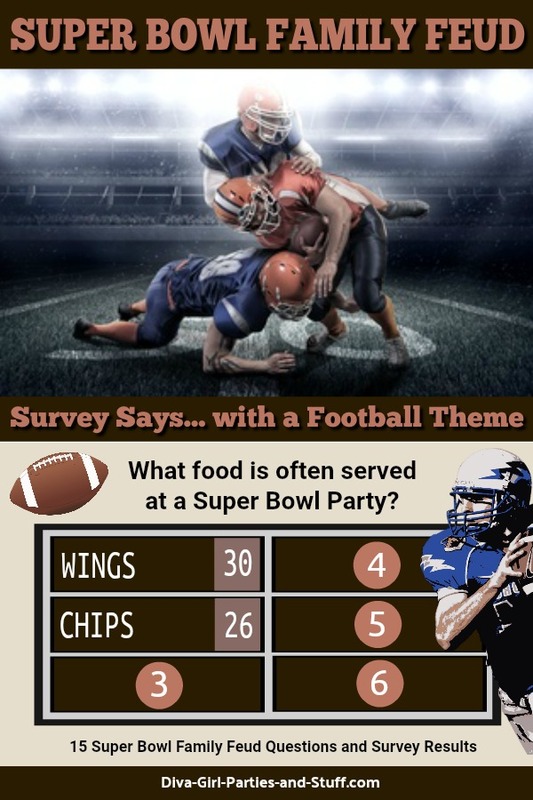 What food is often served at a Super Bowl party? 04. Name a popular professional football team mascot. 05. 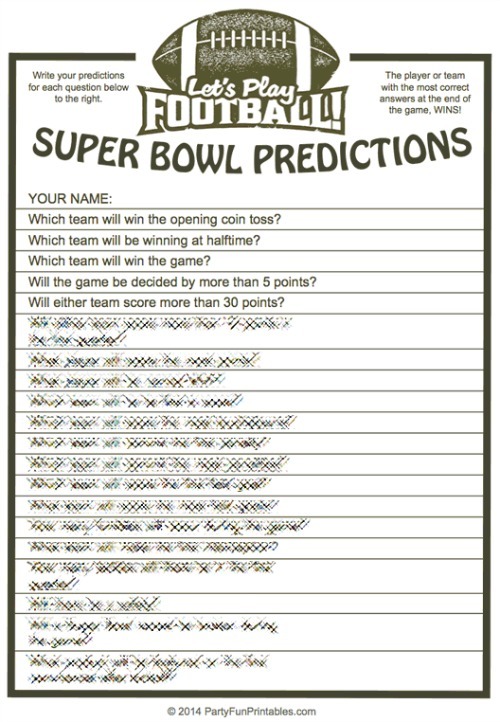 Name something a die hard football fan does on Super Bowl Sunday. 06. What company are you likely to see advertising on a Super Bowl commercial? 7. 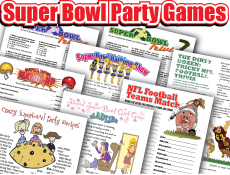 Name something you are guaranteed to see at a Super Bowl. 8. Besides a helmet, name a piece of equipment a football player must wear during the game. 9. What professional football team has the most dedicated fans? 10. Besides the quarterback, name a football position. 11. What performer has provided the most memorable Super Bowl halftime show? 12. Name a professional football team with an animal in its name. 13. Who is the best player to ever compete in the Super Bowl? 14. Name a highly respected Super Bowl coach. 15. Name something a team can get a foul (penalty) for at the Super Bowl. Want to play the game without setting up a full Family Feud board? Here's how. 1. Pick 2 players to go head to head. You can change players after each question or let the winner of each question go on to challenge the next opponent. 2. Ask the question and have the players be the first to shout out an answer, ring a bell, wave a pompom (whatever). 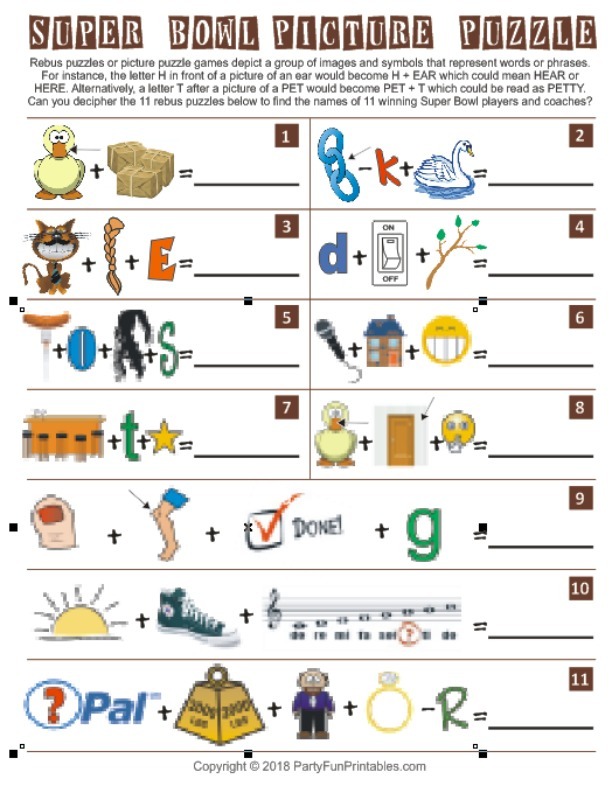 The player who guesses the answer highest on the scoring list gets to choose to play or pass. 3. IF PLAYER A CHOOSES TO PASS, her opponent (Player B) has to guess all of the remaining answers on the list. If Player B answers incorrectly 3 times, then Player A has one chance to guess one of the remaining answers to win. If Player A fails to guess one of the remaining answers, Player B wins the round. 4. IF PLAYER A CHOOSES TO PLAY, then she must guess all of the remaining answers on the list. If Player A answers incorrectly 3 times, then Player B has one chance to guess one of the remaining answers to win. If Player B fails to guess one of the remaining answers, Player A wins the round. 5. Let the winner continue to the next question against a new opponent or choose 2 new opponents if you have a large group and want to give more guests the opportunity to play. 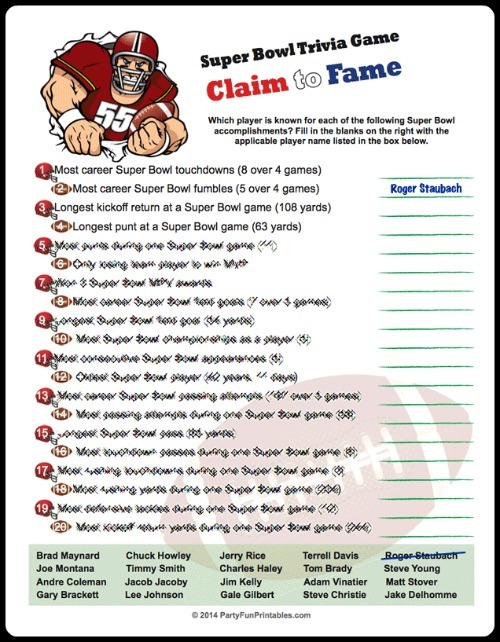 Special thanks to all those who contributed to this Super Bowl Family Feud game.